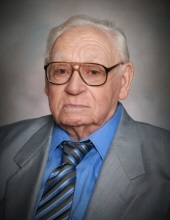 Eldon Eugene Cowles, age 89, of Des Moines, Iowa passed away on September 16, 2017. He was born on the family farm near Pleasanton, Iowa on September 21, 1927, the son of the late Aubrey Wayne Cowles and Anna Maude (Hamilton) Cowles. Eldon was brother to Kathryn (Cowles) McLain of Colfax, Iowa and the late Evelyn Irene Cowles. He had been a resident of Des Moines for the last three years. Eldon and Opal were married on June 18, 1949, at St. Brendan’s Catholic Church in Leon, Iowa. She survives him and they recently celebrated their 68th wedding anniversary. Eldon was the loving father of seven children. Those surviving include Diane Cowles and husband, Kevin Minnihan, of Ankeny, Iowa; Danny Cowles and wife, Judy, of Milan, Missouri; Debra Dyer and husband, Thomas, of Norwalk, Iowa; Donna Tracy and husband, John, of Clark, Missouri; and David Cowles and wife, Ginny, of Holts Summit, Missouri. His sons, Michael Cowles and Duane Cowles, and a granddaughter, Sheri (Cowles) Thudium, all preceded Eldon in death. He was a loving grandfather to 17 grandchildren, 30 great-grandchildren and one great-great grandchild on the way. Eldon’s in-laws, nephews, nieces, cousins and their families who survive him will miss him. Eldon was a lifelong learner, graduating from Leon High School in 1946. While he was working on the family farm he attended college and received his Teacher’s Certificate in 1949. Eldon completed his Bachelor's Degree in Education at Drake University in 1958. He attended Northeast Missouri State College in Kirksville, Missouri where he completed his Master’s Degree in Education in 1959. Eldon was a husband, father, friend, role model, family patriarch, educator, mentor, and teacher. Teaching and working with children was always Eldon’s first choice as a career. Eldon began his career as an educator in Van Wert, Iowa in 1949. He also taught school in Mt Ayr and Vine Oak, Iowa. Eldon had a career as a Superintendent of Schools in many communities in North Central Missouri, Gorin in 1960, Hallsville in 1964, Milan in 1969, Grant City in 1976, Hamilton in 1978. He retired from the Missouri school system from Wheeling, Missouri in 1989. He came out of retirement in 1990, to become Superintendent of Schools in Lineville, Iowa. He retired a second time in 1995. He truly looked forward to going to work every day to have a positive effect on a young person’s life. Eldon was a member of St. Brendan’s Catholic Church in Leon, Iowa. He served as a Communion Minister. Eldon was a man of faith and lived his life exemplifying Christ. He joined the Knights of Columbus in 1964, and was passionate about spreading the Gospel of Christ. During his more than 50 years as a Knight, Eldon achieved his Fourth Degree, served as Grand Knight, and received a lifetime service award in 2016. For many years, Eldon and Opal helped to coordinate and organize the Pleasanton 4th of July celebration as well as the annual fundraiser. He was an active member of the National Education Association. Eldon was a valued member of the Leon Senior Citizen Center, Iowa Retired Teacher’s Association, and Meals on Wheels volunteer in Leon. He was a kind, gracious, and humble man whose character was defined by his integrity. He had a wonderful sense of humor and was a true optimist. Eldon enjoyed many outdoor sports such as hunting, fishing, boating, and camping. He took great pride in passing along his skill and passion to his children and grandchildren. He enjoyed traveling with his family and was always planning his next trip. Upon retirement Eldon and Opal enjoyed traveling to see friends and family or just to have fun. They went to Hawaii, Florida, California, Texas, Missouri, to name a few. He loved watching old western movies. Eldon could often be found fishing, riding his tractor, mowing the lawn, or just working on the farm. Eldon enjoyed spending time with his friends and family for the food, fun, and the opportunity to share stories and laughter. Above all else, he loved spending time with his wife, children, and family. Eldon was once asked how would he want to be remembered. He replied, “Eldon was educated, fun-loving, and liked to play.” All whom he touched with his humor, kindness, charm, wit, and smile will miss him. His passing is a great loss. Visitation and funeral services will be on Saturday, September 23, 2017, at St Brendan’s Church in Leon, Iowa. Visitation will be from 10 -11 a.m. A Rosary at 11:15 a.m. with funeral mass at 11:30 a.m. Burial will follow at Hamilton Cemetery near Pleasanton, Iowa. Slade – O’Donnell Funeral Home is in charge of arrangements. On-line condolences may be left at www.sladefuneralhome.com. Memorials may be made to St Brendan’s Church or to the Knight’s of Columbus in Eldon’s memory. The family would like to thank Patty Russell, ARNP and her team from Team MD; Debbie Slaikeu, RN and her team from Unity Point Hospice; as well as the many extraordinary staff at Calvin Community, 3801 Grand, and South Central Home Health Care for their compassionate care over the years.